Today in 1815 near a small town in Belgium, an Anglo-Allied army defeated Napoleon’s imperial army in a twelve-hour battle that even the victorious Duke of Wellington described as a ‘damn near run thing’ with victory only coming in the evening with the delayed arrival of Blucher’s Prussian forces. The battle of Waterloo marks one of those rare things – an event that most historians can agree on as a defining watershed moment. In the narrow sense of military history, Waterloo was probably the last time that the fate of nations would be decided in a single afternoon. In the industrial age that followed, the breech-loading rifle, railways and the telegraph would decide battles, not dashing cavalry charges. And these battles would be grim matters of attrition lasting days, weeks or months. Most importantly though 1815 marks a political watershed – before it lies the world of the Ancien Regime and its death throes in the Revolutionary and Napoleonic wars, and after it is the age of Capital, what historian Eric Hobsbawn described as ‘the long nineteenth century’ that lasts until 1914 and the outbreak of the Great War. The forces that defeated Napoleon were a coalition of European monarchies who since 1789 had come together to crush the threat of revolution spreading from France. Against all the odds the isolated forces of France, often armed with little more than the revolutionary fervour of a citizen army, managed to hold off the professional armies of old Europe. In besieged Republican France it was the resulting economic crisis and political instability that provided the opportunity for a brilliant but impoverished junior artillery officer from Corsica to come to prominence. Napoleon Bonaparte’s genius as a military tactician in turning defeat into victory when he took command of the ragged and neglected army in Northern Italy was matched by his skill as a political opportunist. Exploiting the political crisis in the Republic, the young general staged a coup to become First Consul in 1799 – and then in 1804 declared himself ‘Emperor’. In doing so he unquestionably betrayed the democratic ideals of the Jacobins. But the resulting regime was also a strange hybrid – a popular dictatorship that pursued a policy of foreign expansion and military aggression abroad, whilst maintaining at home the social gains of the revolution. Land reform and the abolition of feudalism were safeguarded, progressive taxation was used to fund public works, church and state were formally separated, religious tolerance extended to Jews and Protestants, and the rule of law replaced the arbitrary powers of the absolute monarchy of the Ancien Regime. The new social order was codified in a set of laws known as the ‘civil code’ or more often today simply as the ‘code Napoleon’. What has now become a constitutional model for many ‘capitalist democracies’ at the time represented a revolutionary break with the past – and marked the emergence of a new bourgeois ruling class. In response the monarchies of Europe were obliged to sink their differences and combined to resist the threat that France posed to the established order. But twenty years of almost continuous war that lasted from 1792 until 1815, and ranged from Egypt to Russia, saw a succession of alliances fail to defeat France. Finally after the battle of Leipzig in 1814, the coalition forces invaded France – Prussia, Austria and Russia from the east and Britain and Portugal from the south. Paris was occupied, Napoleon forced to abdicate and exiled to the island of Elba, and a restored Bourbon monarchy was installed in his place. It is testament to the popular support in France for the Napoleonic regime that the restored Bourbon monarchy lasted for little more than nine months. The returning nobility failed to acknowledge that society had been turned upside down since the revolution and set about trying to return France to the Ancien Regime. Thousands of demobilised veterans drawn from the peasantry were now unemployed, rootless and still loyal to the Emperor. Meanwhile the Coalition powers were preoccupied arguing over the future partition of Europe at the Congress of Vienna – in particular the role of an independent Poland as a buffer between east and west. Winning over the troops sent to arrest him when he first landed in southern France, Napoleon took his opportunity to march at their head to Paris – and used a plebiscite to restore himself as Emperor with a new constitution that restored the civil code. Royalist opposition swiftly evaporated, and in the space of a few weeks Napoleon was able to mobilise an army of almost a quarter of a million men. This restored regime – christened ‘The Hundred Days’ – was to be short-lived. The coalition powers also mobilised, and from the outset France was surrounded by hostile powers – although the coalition forces had been severely weakened by so many years of war. On the Belgian border Wellington’s forces were not the battle-hardened veterans of the Peninsula War – most of who had been sent off to fight in America – but a motley collection of untested troops and allies from the Netherlands and minor German states. 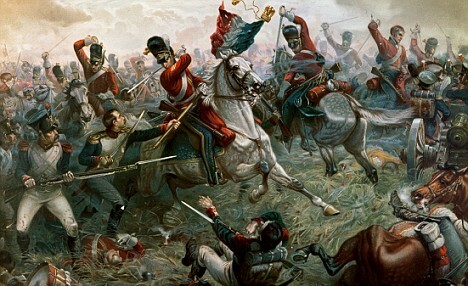 In fact, despite the subsequent mythology of Waterloo, less than half of Wellington’s troops were actually British. But the weakening of the monarchies of old Europe was more far-reaching than simply a tactical military disadvantage. In order to defeat first the revolution and then Napoleon, the coalition powers had set into motion forces that they could not control and that would eventually consume them. The previous decisive campaign of 1814 was known as the ‘War Of Liberation’ and Leipzig as the “Battle Of The Nations’. In Prussia in particular after the humiliating defeat at Jena in 1805, the nation and its forces, fuelled by a nationalist fervour, had been reconstructed as a citizen army on the French model. Even in backward Russia, a new type of nationalist consciousness developed which would expresses itself ten years later in the Decembrist revolt of liberal young army officers. In Britain conscription was not adopted and the army remained a professional one, but for the first time government propaganda appealed to the masses as freeborn Englishmen to overthrow ‘Boney the tyrant’. If Waterloo meant defeat for Napoleon, it did not represent a return to the pre-revolutionary world of 1789. The monarchies of Europe were forced to acknowledge their dependency on the new class now coming into its ascendency – the bourgeois. In the next century France would go through a succession of revolutions alternately producing constitutional monarchies, republics and even a restored empire – but all would be based resolutely on this class and a new capitalist order that would have been unrecognisable to the court of Louis XVI. And in Germany and Austria nation states would emerge based on a popular nationalism that would have equally been unrecognisable to Frederick The Great. My true glory is not to have won 40 battles…Waterloo will erase the memory of so many victories. … But…what will live forever, is my Civil Code.